School is almost over and my panic of “what are we going to do every single day this summer?” is starting to set in. I love my kids, but we all need a break once and a while. Thankfully my kids don’t know how to say “Mom I’m bored” yet. But instead I hear “Mom! What can I do? 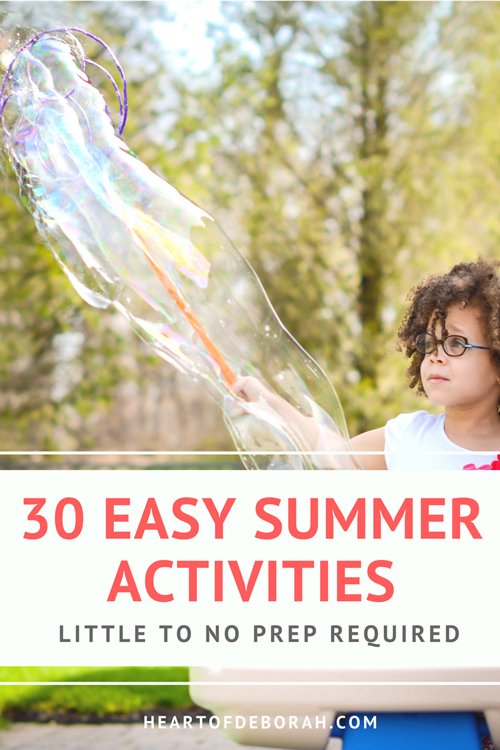 (moan).” So I decided to create a list of 30 EASY summer activities for kids. This calmed my nerves about having nothing planned this summer and it got my kids excited to spend time outside. 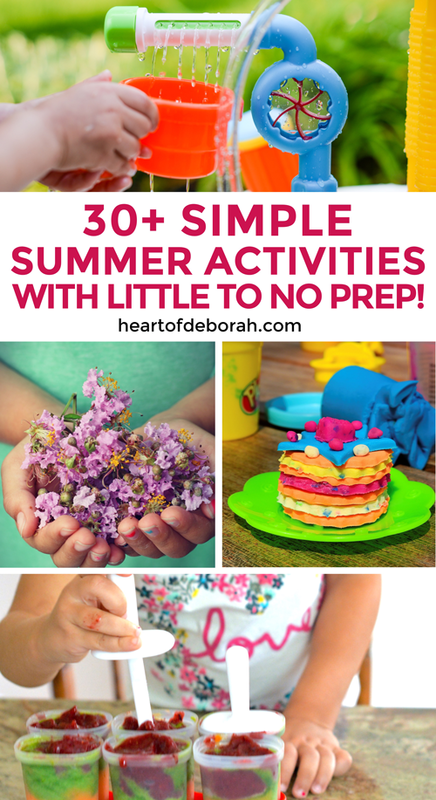 The best part, little or no preparation is required for these easy kids activities! Although I love a good Pinterest kid’s activity, I wanted to stay away from “educational” games or activities. This summer I want our kids to enjoy the fresh air and just be a kid, grass stains and all. 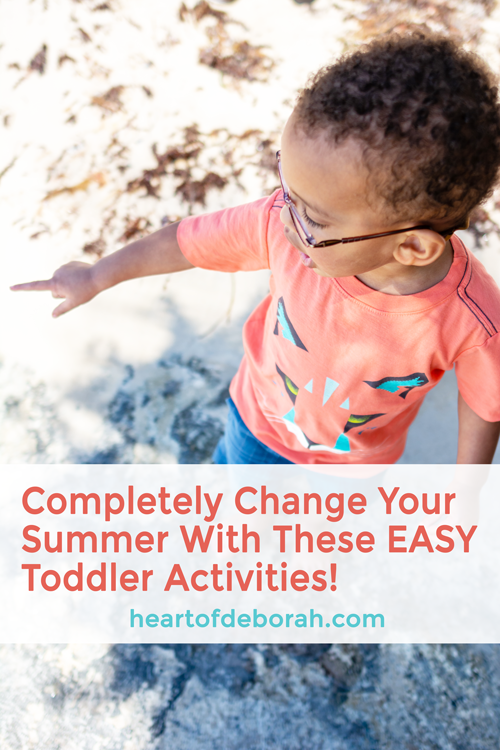 I believe it’s important for kids to learn how to play independently and this is something I’d love my toddler to do more of this summer. Some days he is okay with wandering around our backyard looking for butterflies or picking grass, but other days he wants more structure and asks me to do an activity with him. I don’t want to spend a ton of money on outdoor toys and as I said earlier I don’t want to take time to create elaborate activities for our kids either. So I did my best to brainstorm simple summer activities for kids. Sometimes I just need a quick reminder of EASY activities. We don’t do play dough or sidewalk chalk every day so when I remember we have activities like this our kids are thrilled. It also keeps their attention because it is something “new.” I hope you find this list useful in your summer adventures! Buy toys from the dollar store and let the kids imagination take over! Make ice balls: Fill up water in a balloon and freeze, cut off balloon and play! Plant flower seeds and watch them grow every day! Create an outdoor obstacle course with tunnels, slide, jump rope, etc. Thanks for reading our fun summer activities list! If you want to download the list to print and hang on your fridge download it here. Also be sure to follow Heart of Deborah on Instagram for more parenting inspiration and encouragement!